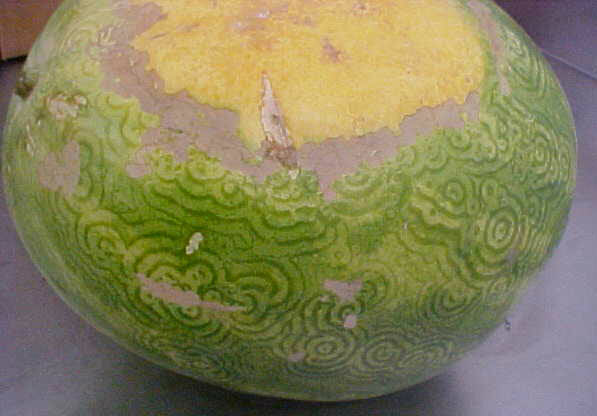 A few of you may have encountered some strange circles affecting the rinds of watermelons. The circles may vary in size and the area affected, but they still usually materially affect the appearance. This defect is caused by a virus, named the papaya ring spot virus. These images show the classic symptoms of the virus; the typical circular patterns. 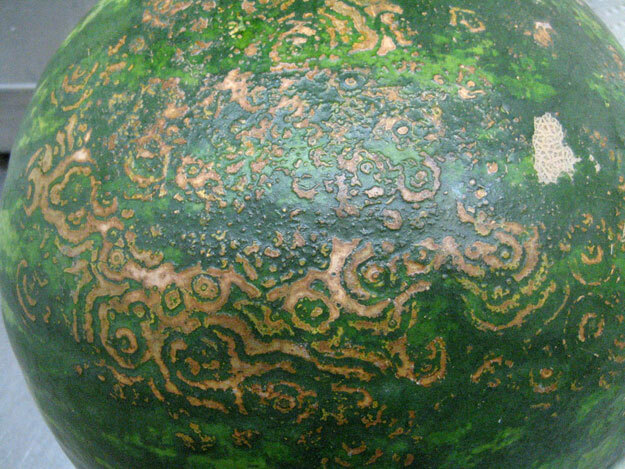 The virus causes many problems with watermelons grown in Florida, affecting the plants. leaves and the fruit itself. The virus is transmitted by aphids, as they feed on an infected plant and move to healthy plants. If you do encounter this defect, rest assured the defect will not progress. The circular patterns will not become more in number, nor will they spread to perfectly good watermelons. The USDA does not have any specific scoring guidelines, so you would use judgement to determine if the defect materially affects (damage) or seriously detracts from the appearance (serious damage) of the melon. If you come across watermelons pictured above, they would be scored as serious damage. The US Grade Standards for the US No. 1 Grade allow for 10% defects including 5% serious damage. to some buddies ans also sharing in delicious. And certainly, thanks on your sweat!